You know you have a good recipe in your hands when it had to be copied from a friend who got it from someone whose name is on it with their phone number asking you to call them if you have any questions. This my friends, is a winner of a recipe. 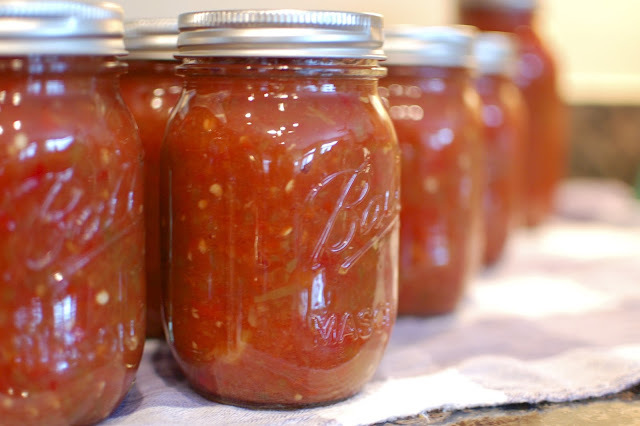 This was my first canning project post applesauce last year and a recipe we enjoyed all year long. We just made another batch of it this year, tweaking it a bit. Although it's labor intensive on the front end, the veg hangs out all night and the next day you really have a few steps which make it somewhat manageable to see this as a nap time canning project. 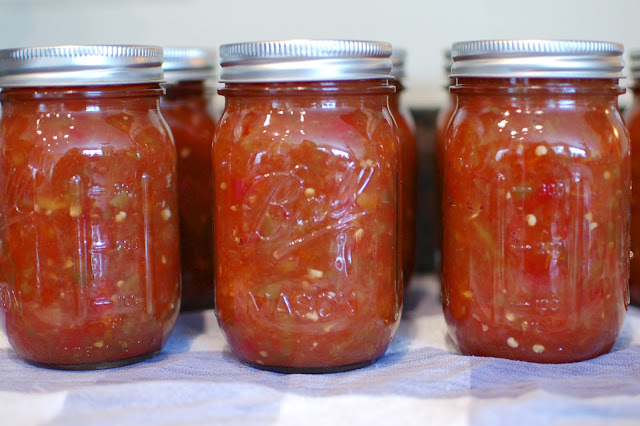 The recipe can easily be quadrupled if you end up getting a box of seconds and want to use all your tomatoes for the salsa. Why wouldn't you? I'll start by just giving you the base recipe but know it can grow. Last year we did end up making it times four, but this year I didn't have as many seconds and it was just times three. We'll see how far we get with the salsa this year or if Benjamin is up for another night of chopping onions and jalapeños. 2 quarts (about 8 cups) fresh tomatoes, peeled and diced into 1/2 inch chunks. Roma are best. 6 jalapeno peppers- leave seeds in and handle with care. Use 1-2 more for more heat but if you're making this recipe x4 don't feel like you need 24 peppers. 1. Peel your tomatoes. I use this water bath technique and find it works out the best. You simply score the bottom of your tomatoes, core them, and place in boiling water for 2 minutes then into an ice bath. Allow to cool and the peel will come right off. 2. Put chopped tomatoes into a large bowl with the chopped onions, peppers, and garlic. You can chop the onions and peppers and garlic in a food processor if you'd like but I find this gets them too watery so we chopped them by hand. Labor intensive but worth it. 3. Sprinkle salt over the vegetables, cover, and refrigerate 8 hours or overnight. 4. The next day drain the vegetables in a colander and put into a large pot. 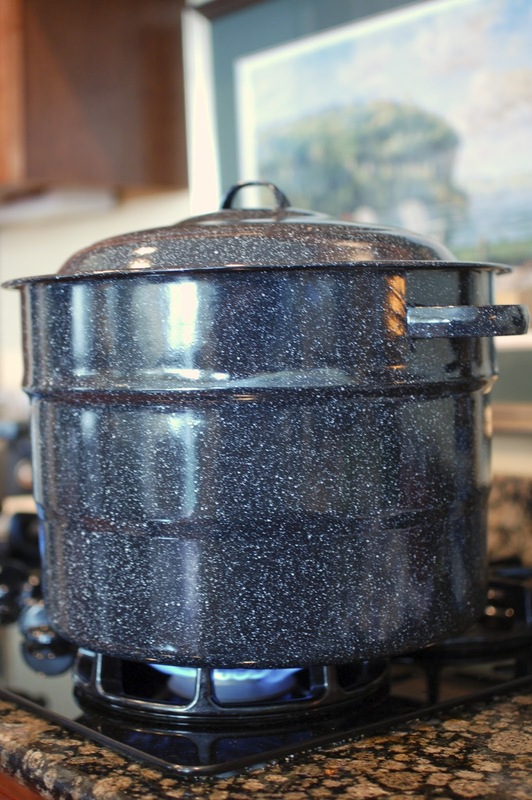 Prepare your canning equipment at this point- the water bath, sterilized jars, lids, and rings. 5. Add in the tomato puree, apple cider vinegar, and sugar. Bring to a boil, stirring often. Allow to simmer for 5 minutes, still stirring often. Ladle into hot sterilized jars and put on the lids and rings according to manufacturer instructions. 6. Process in the water bath- 10 minutes for pint and 20 minutes for quarts. Allow to sit on a dish cloth for 24 hours, unmoved, before storing away. Good luck and enjoy, I know we do!